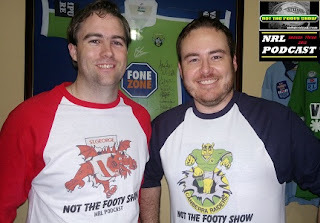 Round 2 Tipping Preview with NOT The Footy Show's NRL Podcast. DC Chapman and Warrick Nicolson are joined by Matt Duncan, Maria Tsialis, GT and Eyes for a new NOT The Footy Show episode. Round 2 tips, Corey PAYNE banner competition, #Fridgegate, NSW Cup modelling the QLD Cup, Day Footy v Night Footy (incl. night training? ), Bellamy's Hillbillies and the New Orleans Saints Bounty program. We also reveal Special Fried Rice tips and all the panel's tips for Round 2. We'll be back on Monday night for our Round 2 Review Show.